Short stories can be wonderful things. As a reader, you immerse yourself in them quickly and emerge changed not long after you begin, so long as they are written correctly. A lot of modern short stories are what I have heard termed 'moment of truth' short stories, in which the world is presented as being something that seems normal, and perhaps even innocent at first, but by the end of the story we see that the narrator/protagonist/we are completely wrong. It's like being punched in the stomach, yet it's pleasant. A lot of readers don't have time for short stories which is a shame. As a result, a lot of publishers don't have time for them either, unless they are by someone who is already famous for having written a novel or two. 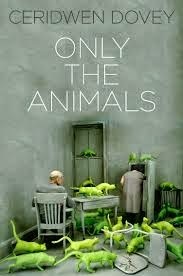 Into this comes Ceridwen Dovey, a South African born Sydney-sider, and her collection Only the Animals. This collection consists of ten pieces told in varying styles which feature as their main characters animals at the periphery of history. It begins with a story told from the point of view of a camel in the Australian outback who is travelling with Henry Lawson, and ends with a special ops dolphin writing to Sylvia Plath from beyond the grave to try and mitigate her guilt for her part in modern naval anti-terrorist activities. In between there are all kinds of wonderful. Dovey's writing is fresh and adaptable. Her style changes with feline grace to suit her subject matter. In her story about Kiki the Cat, who follows Collette to the trenches of World War One and is left behind, she is suitably aloof and in a strange way, seems to slip fluidly between genders, in a homage to Collette herself. In a series of letters between Red Peter and his wife in-training, Dovey's prose enters a Kafka-esque world where chimps are humans and humans are chimps, and the lines between them are so blurred that it soon becomes evident that the object of Red Peter's affections are not the chimp bride 'appropriately' trained for him, but for her human owner. His sense of betrayal, when he is returned to the cage during the time of great starvation in 1930s Germany is all the more poignant because we come to picture him in his suit, in a hotel suite, writing letters. In times of affluence this is all right, but in times of famine, the people see Peter as obscene and forget that it was human curiousity that made him behave that way in the first place. In 'Somewhere Along the Line the Pearl would be Handed to Me', a narrative of three Mussels travelling the ocean floor is told in a style that pays tribute to Kerouac (prefaced with a quote from the man himself). The reader, who by this point is familiar with the historical significance of the other stories is left wondering what event this story is to shed light on until the last possible moment.... it turns one of the most traumatic events in recent American history into a senseless, random attack that the marine life had no means of understanding, cleverly parallelled with the way the American public must have felt at the same time, before Pearl Harbour became synonymous with all the eulogising it's had since. This collection is brilliant, beautiful, subtle and un-put-downable, to use that non-word again. If you're looking to get back into reading short stories, begin here. Dovey showcases a talent for allegory and restraint that is not to be missed. Perfect for reading on lunch breaks or tedious commutes, enter the world of the animal kingdom.